To begin using ePay, you must first create a free myHEALTHware account. If you are a SOAPware user, you will want to create your myHEALTHware account through SOAPware. For instructions on setting up myHEALTHware, please see: Setting Up myHEALTHware. If you need further assistance creating your myHEALTHware account, simply submit a ticket at www.soapware.com/ticket. 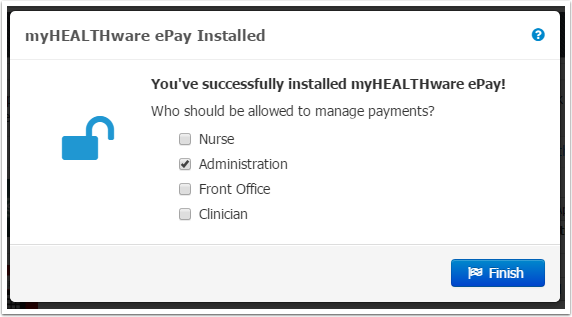 To install myHEALTHware ePay, log in to myHEALTHware as the administrator of your clinic organization, then click on the Marketplace tab. Click Install App next to myHEALTHware ePay. The ePay installation wizard will begin. The first screen gives you some brief information about the features available with myHEALTHware ePay and the transaction fee associated with each customer/patient payment. Click Continue to proceed. 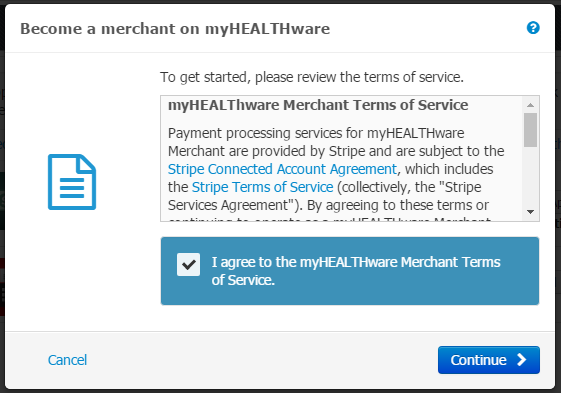 To begin receiving online payments from your patients, you will first need to complete some information in order to become a Merchant on myHEALTHware. On this screen, read the Terms of Service, check the "I agree" box and click Continue. Enter the information for your Company Representative. The company representative can be any staff member who has authorization from their business to set up a myHEALTHware Merchant account on its behalf, and knowledge of the bank account to transfer the business' received funds into. 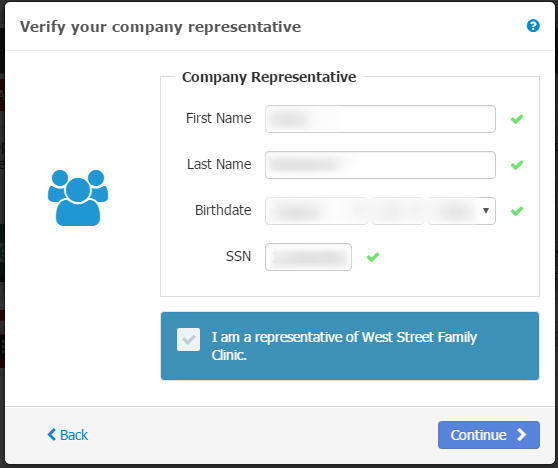 Once completed, check the box to indicate this person is a representative of the organization and click Continue. 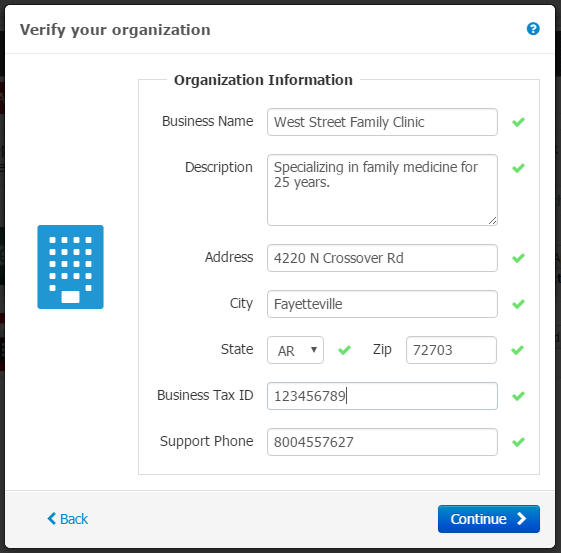 Next, you'll need to verify that your organization information in myHEALTHware is complete and correct. Fill out each field and click Continue to proceed. 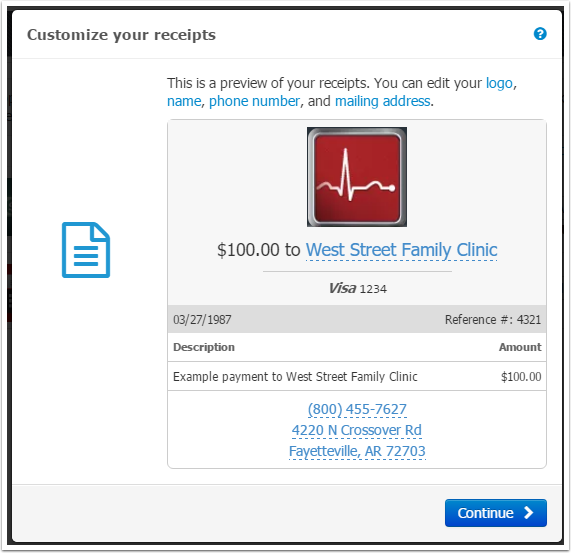 Next, you'll need to tell myHEALTHware where you would like your patients' payments to be deposited. 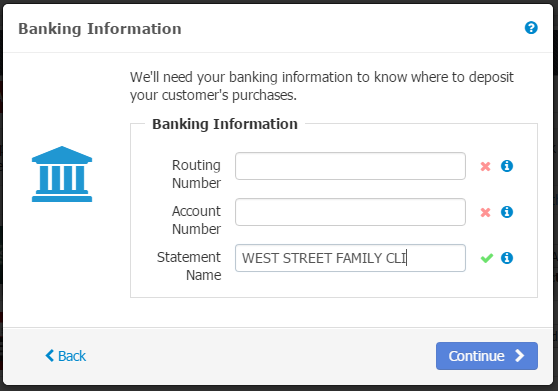 Enter your bank routing number, account number, and statement name, then click Continue. Review all of the information that was entered in the previous screens and confirm that the information is correct. Click Confirm to continue. Next, you have the opportunity to customize some elements on your payment receipts. 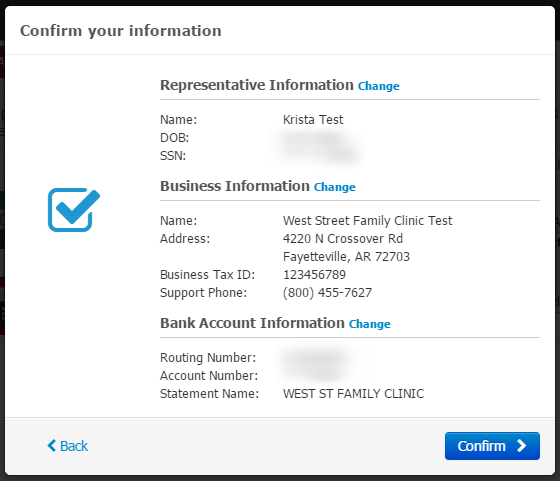 After your patients make a payment to your clinic using ePay, they will be given a receipt similar to the one displayed in the screenshot above. Next, you'll need to choose a web address for your myHEALTHware Organization. If your patients do not have a myHEALTHware account, they can use this web address to submit payments to your clinic online. By default, your web address will include your clinic name. If you wish to change your clinic name as displayed in this box, modify it here. The web address that your patients will use to submit payments is displayed. Next, select which staff members you wish to manage payments that come in from patients. Check each role that you wish to grant this permission to. If you wish, you can place a "Make a Payment" button on your clinic website. 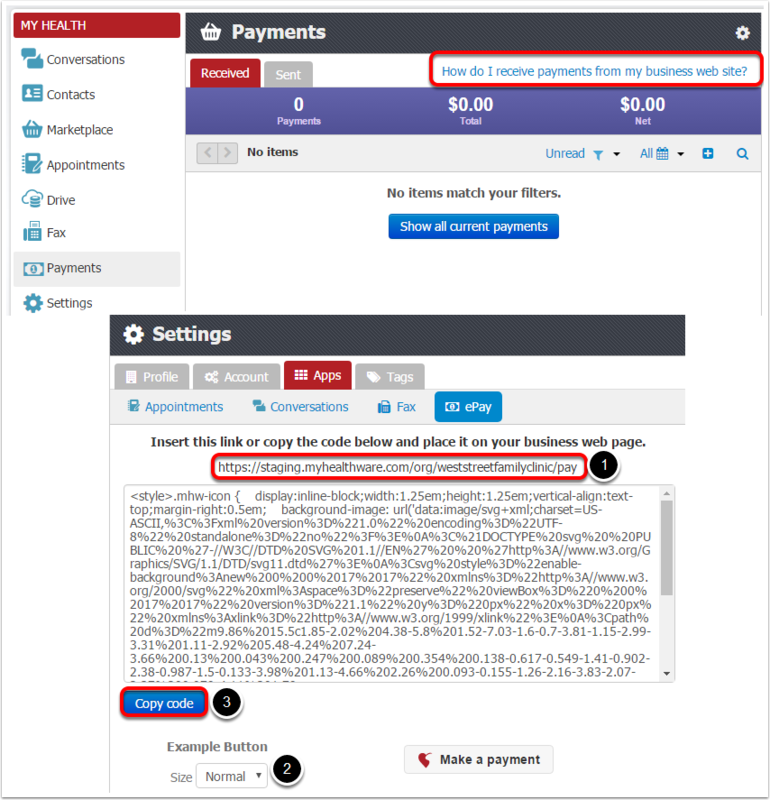 To obtain the code to place a button on your website, go to the Payment tab, then click on "How do I receive payments from my business web site?" You can direct your patients to the link at the top of the page to make an online payment. Patients can also log in to their myHEALTHware account and click on the Payments tab to make a payment. If you wish to add a button to your clinic website, select the size of the button (Small, Normal, or Large). Then click the Copy Code button and add this code to your webpage. Start Accepting ePay Payments from your Patients! Get Paid Faster by receiving payments that are automatically deposited into your account! Easy to Use Reports such as filter payments by date range and/or status; Easy search by name, confirmation code, and invoice or account number; archive and unarchive payments; export payments to CSV file and much more! Your patients can make a payment by logging into their myHEALTHware account and clicking on Payments. 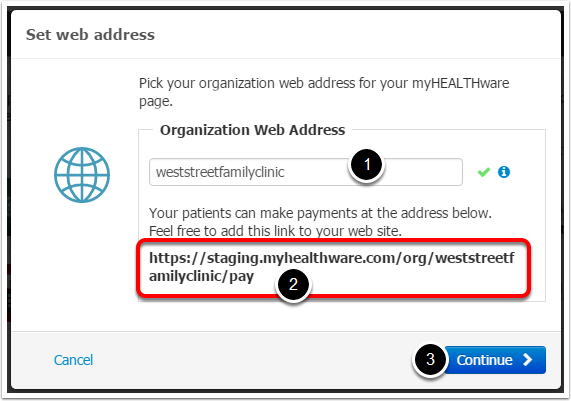 In addition, if the patient doesn't have a myHEALTHware account, they can make a payment as a Guest by going to the link listed in the above screenshot (ex: https://myhealthware.com/org/clinicname/pay).